Cainiao Smart Logistics Network is preparing for this year’s ‘Singles Day’ global shopping spree with 51 chartered flights and upgrades to its technology. The logistics unit of Chinese e-commerce giant Alibaba confirmed that the chartered freighters will take goods to West Europe, Russia and Southeast Asia for AliExpress and Tmall World customers. Cainiao vice president Ben Wang said that the company needs to keep developing its systems, anticipating growth and seeking greater efficiency in order to ensure it continues to meet customer expectations. "It was only five years ago that parcel orders surpassed 100m for the first time. Back then it took nine days to deliver the first 100m parcels," he said. "Last year, it took less than three days (2.8 days) to deliver the same number of parcels. “Consumers increasingly want faster, better delivery, so that’s what we’re doing. This year, we’re striving to achieve a new high, leveraging the beauty of scale and technology." Last year, the e-commerce-enabled event, which originated in China, generated worldwide sales of $25.3bn, dwarfing Black Friday/Cyber Monday combined sales of $14.48bn. The term Singles Day was chosen because November 11 features all the ‘ones’ and took off in 2011 – 11/11/11. People celebrate the day by buying themselves gifts and, with Alibaba promoting it widely, sales have grown rapidly. Among the developments at Cainiao is a new smart warehouse that it has opened in the city of Wuxi in China’s Jiangsu Province. The facility boasts 700 automated guided vehicles and forms part of the company’s first IoT (Internet of Things) Future Park. 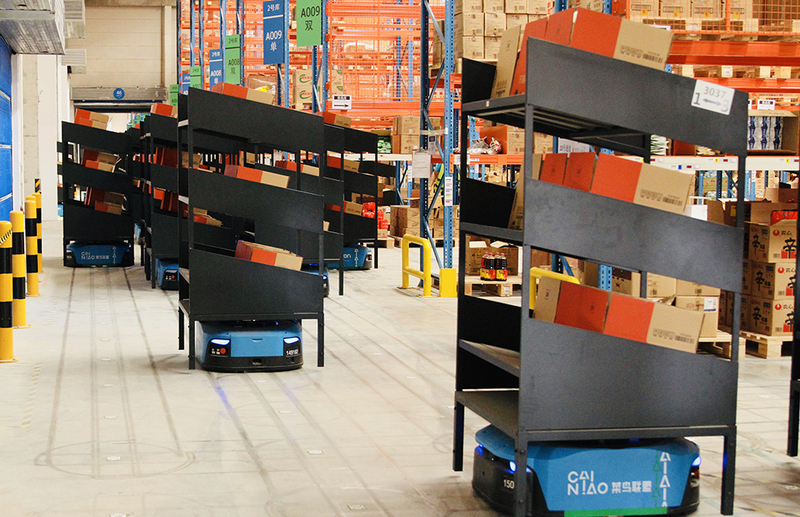 Cainiao said the IoT technology in the smart warehouse can automatically direct vehicles to drive, load and unload. It will plan the best routeings to avoid collisions and intelligently distribute parcels. As a result, the company claims, 50% more orders can be fulfilled by the warehouse than would be possible in a traditional one within a given time period. Another step forward is Cainiao’s Sky Eye cloud-based video monitoring system, which taps into the cameras in logistics facilities across China and transforms them into smart IoT devices to improve efficiency. Sky Eye can help delivery firms identify idle resources, for instance. Cainiao partners Deppon, ZTO Express, YTO Express, STO Express, Best Express and Yunda Express are all going to use the system during this year’s 11.11 event. Ahead of the Global Shopping Festival, Cainiao and its partners have prepared bonded warehouses across China totalling over 1m sq m – an increase of over 80% compared to last year. These locations will store goods as close to consumers as possible in advance of 11.11, so as to cut delivery times. Noting that this year will be the first time that goods ordered during 11.11 will be delivered directly from stores to customers during the Festival itself, sometimes within minutes, Wang said: “Cainiao is the logistics backbone of Alibaba’s New Retail strategy. "We are providing an online and offline, cross-platform supply-chain solution to merchants and enabling them to cut inventory costs, while increasing operating efficiency, especially around 11.11 ­- the busiest season of the year. “Ultimately, consumers will enjoy a brand-new shopping experience, as delivery service will always be on-demand." Copyright © 2019 DVV Media International Ltd All rights reserved. Website by DVV Media International Ltd.